This sporty camo jacket will be perfect for a brisk spring or fall day. The Base Jumper Raincoat by Puppia is waterproof and designed to reflect current human fashions. 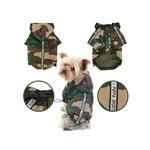 This camo print wind breaker dog jacket is lightweight and lined with mesh for ultimate comfort. Base Jumper Raincoat Wind Breaker by Puppia - Camo Customer Photos - Send us your photo! All this fur requires a good raincoat! The lightweight Puppia Base Jumper windbreaker in camouflage is perfect for keeping Dasher dry during a walk in the countryside on misty spring day. I really like my new rain jacket! It keeps me dry plus all the girl puppies think I like cute! 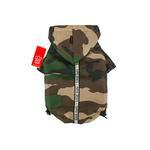 Puppy Louis sporting his Puppia Camo Rain Jacket - super cute!!! Such a cute raincoat for a boy dog! I was looking for something lightweight for the spring/summer, and this does the trick. It goes on easily with velcro closures, has adjustable drawstrings, and keeps my PomChi dry. It took a few walks for him to get used to the "sleeves" but he's fine with it now. He does not like the hood, so I don't use that and just clip his leash onto his collar outside of the coat. Note: There is a slot in the back of the coat through which you can thread your leash to clip onto the collar, or if the ring on the collar is small enough, to slip that through and attach the leash on the outside of the coat. I tried to do that, but the ring on my dog's collar was too big. Posted On 04/30/18 by Bethany C from Damascus, MD Yes, Bethany C recommends this product! I have a little male pomeranian, and trying to dry him off after a walk in the rain is a major task. So getting a lightweight raincoat for spring/summer was a must. This Puppia windbreaker is perfect. It's light, it's easy to get on and off of him, and it absolutely keeps his back and belly dry. Plus I love the camoflage style for a little boy dog! I think that Dasher felt the "arms" of the coat were restrictive at first, but by the second wearing, he was used to it and didn't keep stopping while we were walking. He does not care for the hood, I think because it tends to fall down and cover his eyes, so we don't use the hood much. One trick with the slot for the leash: I thought I was supposed to thread the ring from his collar through that hole, but later realized that it works best to thread the leash through the hole and clip to his collar ring under the coat. Posted On 12/01/14 by Nikki M from , Yes, Nikki M recommends this product!